Our most recent conversion, Meadow Barn is a 5*Gold cottage for two with separate kitchen, dining and living rooms downstairs. It has its own enclosed patio which has a covered area with a woodburner to keep you warm into the evening. 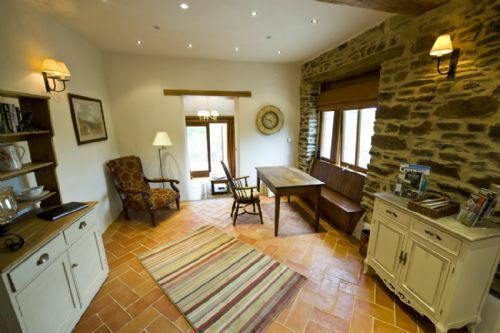 Beautifully finished with terracotta flooring downstairs, oak upstairs and underfloor heating throughout. Fantastic short break away in a beautiful location. Waking up each morning to just the sound of the birds was delightful. The hot tub was great and made for a really relaxing break. The new owners of Devon Country Barns were fantastic hosts and extremely helpful. We wish them every success in their new venture. We had a wonderful few days in Meadow Barn; it's a comfortable barn in a beautiful setting. Richard and Ute were super hosts, providing delicious cake and a very warm welcome. Our only slight gripe was that the barn smelt very damp in the kitchen and dining area which became increasingly unpleasant and some of the kitchen equipment had been left dirty. We stayed for 2 nights to celebrate my 40th birthday. It was a totally relaxing break with fantastic weather. Made good use of the hot tub which was lovely once the sun went down and the evenings got a bit chilly. This was our second visit and won’t be the last. A 3 night break and back again to a simply wonderful barn. Very high spec and has everything one could need for a short or long stay. Being dog friendly and in a dog paradise location is just the icing on the cake. Cannot rate it highly enough. Stunning beaches to the north and Dartmoor within range too. This was not the first time we had visited DCB and as usual it did not disappoint. The owners, Richard and Ute, we so welcoming and the barns were immaculate and so comfortable with a very high spec. Our dogs had a great time in the river playing with the resident flat coated retrievers and we can’t wait to go again!! We very much enjoyed our stay and found all the facilities and services excellent. We will look forward to our next booking. Lovely short break for us and our Flatties. I have followed The Barns on Facebook for sometime and longed for the opportunity to visit with our two flatcoats. Finally the chance came up and we were not to be disappointed. It is a beautiful spot for both humans and dogs and we thoroughly enjoyed our stay in a cottage that had been v tastefully done, we especially liked the outdoor/indoor eating area. We will be returning as soon as possible. Fabulous 5 star accommodation where dogs are welcomed. This is our 3rd stay at Devon Country Barns but our first time in Meadow Barn and as expected we were very impressed with the accomadation. 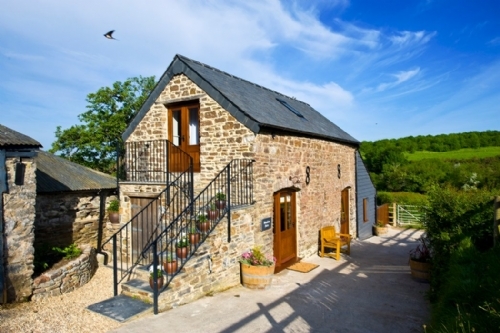 Devon Country Barns offer everything you need for a 5 star self catering accomadation the added bonuses being the hot tub and the lovely enclosed field and stream to exercise our dog.The Barns are an ideal base to explore Devon and Cornwall. We are already looking at dates to book again for next year. we had the most perfect stay in Devon Country barns,we couldn't expect better holidays.Very warm and friendly welcome of the Mc Howat's ready to help and answer every question. we certainly will be back next year. We stayed in Meadow barn for four nights as a mini-moon and had a wonderful stay. 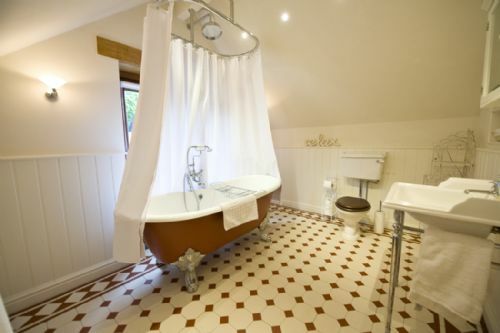 Meadow barn qas excellent value and presents as a superb, well equipped and exceptionally clean barn conversion for two. We brought our greyhound Tom who loved having so many walks so close by! Excellent place for dog owners as there are even kennels on site and lots of space for dogs to walk and run. The hot tub was also spotlessly clean and well maintained, perfect for relaxing under the stars and a lovely outdoor snug with seating and heater is perfect to make the most of the lovely meadow views. We had a lovely stay and will definitely be recommending to friends and family! Can't fault the accomodation, setting or hosts who presented us with fresh flowers, home made cake, fresh eggs, milk and wine on arrival! We had a wonderful week at Meadow Barn, the most comfortable well equiped holiday accommodation one could wish for. Riley our labradoodle had a great time too. Shh! Don’t tell everyone.....they’re all want to visit! Meadow barn is a lovely barn, that is well decorated & has everything you need for a holiday including an outside room that is just perfect to read in or enjoy a meal. As an added extra it has a hot tub which is great to ease your muscles after a long walk on Dartmoor. The owners are friendly & approachable & are full of local knowledge they are happy to share. The barn is one of 5 barns set in meadows with sheep, plus an orchard & a river for the dogs to frolic in. Book it, you won’t be disappointed! Fabulous place to stay!. Our second time. Dog friendly ,great hosts ...secure field for the hounds which is great . The whole experience is great with super places locally to visit and the standards are first class at the barn so after a busy day sightseeing you can relax in great surroundings in the evening with the hounds enjoying a holiday too... a river and field to run in ... would highly recommend . Meadow Barn was perfect for a weekend getaway for two plus a dog. Everything had been thought of to ensure a great stay. We stayed in Meadow Barn, for 2 people, the cottage was perfect, clean, spacious, all mod cons, a hot tub and beautiful scenery. We met Richard, the owner who showed us around the cottage, he was very friendly and helpful. Returned to DCB after few months and we have no words to describe how wonderful was our time there. Ute and Richard are simply two friends and their dogs simply gorgious. We have just completed our fourth stay at Meadow Barn and love the ambiance of the barn. The barns each have a private patio with a hot tub and there are fields running down to the river which everyone, dogs included, can enjoy. The barns are superbly equipped and comfortable and the log burner gives a very homely feel on a winter evening, though not strictly necessary for heat as the underfloor heating works brilliantly. Richard and Ute, the owners are very welcoming and there is always a home made cake, eggs from Devon Country Barns own ducks and chickens and fresh flowers in the barn on arrival. We can’t wait for our next visit. A beautifully set out and spacious barn with all the amenities required, the hosts are friendly and approachable, the added gifts of fresh eggs and homemade cake are a lovely touch. It is in an ideal position for exploring both Devon & Cornwall, travelling to the moors and to the beach is only about 1/2 hour each; we took 3 dogs who also had a great time on the large field and stream available behind the barns. This was our second stay at Meadow Barn - it's a perfect hideaway from the hustle and bustle of daily life. Set in the grounds of the owner's house and one of five high specification conversions, once you are in the barn there's comfort, privacy and everything you need for your stay. A lovely welcome gift of cake, wine and fresh laid eggs was provided, as well as unlimited logs for the two wood burners. The hot tub is perfectly positioned for privavcy and a stunning view across open countryside - we even saw a few shooting stars on our last night.